The Hallow is an Irish horror film steeped in lore of the land. Joseph Mawle plays Adam Hitchens, a conservationist who goes to Ireland with his wife Clare (Bojana Novakovic) and infant son to study a forest there. Superstitious locals believe the woods are inhabited by baby-stealing demons – a concept Adam dismisses until strange things begin to happen in and around the home where they're staying. Eventually, the danger increases, as it becomes clear that the demons really want these trespassers out. This leads to a significant event that forces Adam and Clare to fight back against a fierce, unrelenting enemy. Forests have long provided fertile locations for horror stories. It can be difficult to find an original way to present them, but The Hallow does. Director Corin Hardy and cinematographer Martijn Van Broekhuizen give the movie a dark, ominous look, particularly in the scenes set outdoors, where the woods seem to loom maliciously. Ace special effects also contribute to the overall effectiveness. The creatures – initially seen in brief snatches, but later shown in all their gruesomeness – are very authentically created. Horror movies sometimes rely on fake CGI creatures or practical ones that don't quite pass the reality test. The FX team on The Hallow has done an absolutely brilliant job designing practical demons that more than fulfill the creepiness quotient. The first half of The Hallow is admittedly slow, possibly even a bit too slow. It takes a while to get going, and there could have been more initial clarity about what, specifically, Adam is studying. He and Clare are also a little sketchy as characters. We don't get to learn a whole lot about them. Over time, we sense important qualities they have (e.g. Clare's mama bear protectiveness) but filling them out a little more would have strengthened the story overall. The real focus here is the concept itself. Thankfully, that concept works. The pace picks up considerably as the film progresses, with a number of expertly executed scare scenes delivering real shocks. Hardy cranks up the tension, making each confrontation with the creatures more intense and ghastly than the last. Ingenious staging of these sequences maximizes their impact; to cite one example, there are shots of a blanket being pulled through the woods, with Clare desperately trying to catch up to it. The big conclusion of The Hallows is maybe the most tense part of all. The movie ends with one character having to figure out what is and isn't real, with only seconds to do it before calamity strikes. If you can hang in there through the initial stages, The Hallows gets really good, really quickly. This is a sophisticated and scary horror picture with way above-average effects. 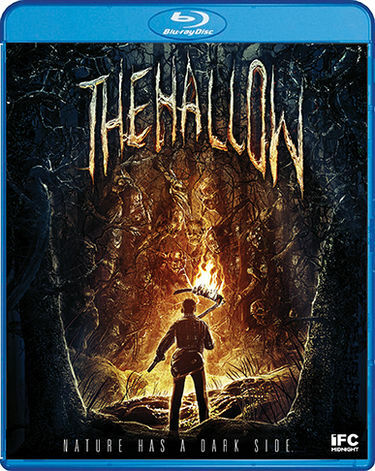 The Hallow hits DVD and Blu-Ray on April 5. The folks at Scream Factory have typically packed the disc with high quality extras, starting with audio commentary from Corin Hardy. There's also a making-of documentary, plus three behind-the-scenes segments, which focus on the story, the influences, and the practical FX. They all provide a solid look at how this eerie film came together so well. There are additionally four galleries: the director's storyboards, the director's sketchbook, sketches from a creepy book that figures prominently into the story, and creature concepts. Finally, the original theatrical trailer is included. Picture and, especially, sound quality on the Blu-ray are outstanding. Crank up the volume to get the full spooky effect. The Hallow is unrated, but contains adult language, violence/gore, and sequences of extreme terror. The running time is 1 hour and 37 minutes.